"It is fantastic to see a disused building brought back to life in this way, and even better that its new purpose is to provide a vibrant home for Leicester's talented artists and designer makers! There is a real need for creative hubs such as Makers' Yard to provide support and opportunities to nurture craft and design talent and grow strong businesses. Well done to all involved in this project, and we look forward to a long and productive partnership." "As a craft practitioner and educator I can see our DMU Design Craft graduates setting up and settling in to the creative atmosphere and community of Makers' Yard. Its a place they could really put down roots and make their mark on Leicester's cultural economy." Angela Thwaites, Senior Lecturer, Design Crafts course, De Montfort University. "This project demonstrates our ongoing commitment to developing the Cultural Quarter as a centre for Leicester's cultural industries to thrive and grow. This exciting new project will help restore one the city's historic treasures." "This is a brilliant building with such a very important history. We are very lucky to have it in Leicester." Rowan Roenisch, Leicester Group of the Victorian Society. "It's really exciting to see what has been achieved at Makers' Yard. As a creative based in Nottingham, there's so much inspiration the local creative community can draw from this regeneration project in Leicester." Debbie Bryan, creative practitioner and retailer, Nottingham. "For years Leicester has had no studio space specifically for designer-makers. This new studio will transform the way we work in Leicester. Maker's Yard will be a melting pot of ideas, a central hub for all the exciting work that artists and craft makers are doing in Leicester and an inspirational place for new and emerging makers, helping to promote and celebrate the talent in this city. For me, being part of a craft community will be a breath of fresh air, a new start and the starting point for lots of exciting opportunities. Ruth Singer Studio is a public-facing venture, running classes and events for all ages as well as my personal studio space, which I hope will add life and energy to the new building from the first day of opening." Ruth Singer, author, teacher and textile artist, formerly in Studio 1 at Makers' Yard. "We used to make socks for all the football clubs like Manchester United, Liverpool and Leicester City. We even made a pair for Terry Wogan! I think it's fantastic that this building will help bring new industry back into the area." Mrs Lydia Marshall, ex-worker at ‘Charnwood Hosiery Factory', as the building was once known. European Regional Development Fund (ERDF) is a funding body that works to reduce economic differences between member states of the EU. It does this by supporting local economic regeneration and by safeguarding jobs. Since 2007, England has received €3.2 billion investment from ERDF in projects that are designed to benefit various local economies. 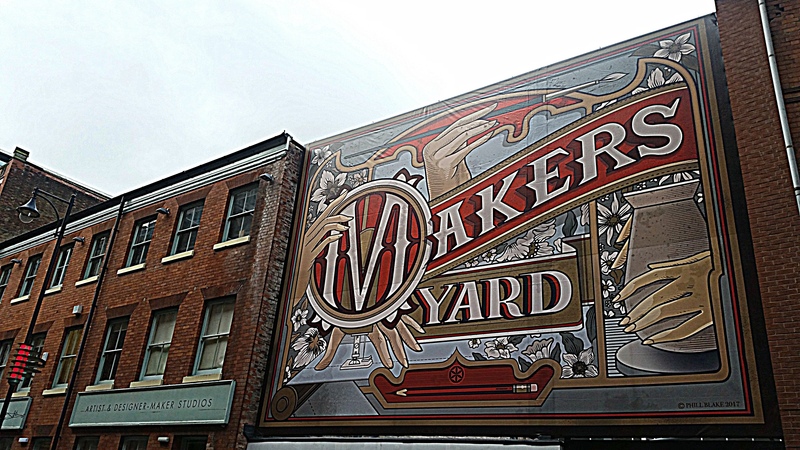 Makers' Yard is one such project that is made possible by funding from ERDF, with match-funding from Leicester City Council.